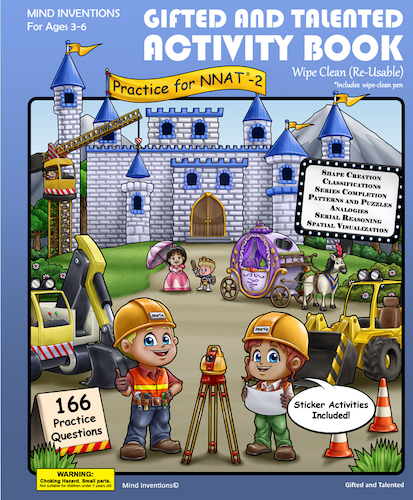 Gifted and Talented WIPE CLEAN (re-usable) Activity Book - Volume 2 (NNAT-2), for children ages 3-6; Based on NNAT-2 standards, the book offers 90 pages full of colorful content including 166 creative practice questions, stickers and fun and exciting activities. 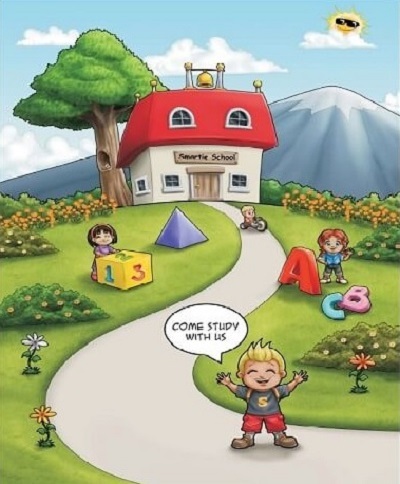 Gifted and Talented WIPE CLEAN (re-usable) Activity Book - Volume 1 (OLSAT), for children ages 3-6; Based on OLSAT standards, the book offers 88 pages full of colorful content including 154 creative practice questions, stickers, flashcards and fun and exciting activities. 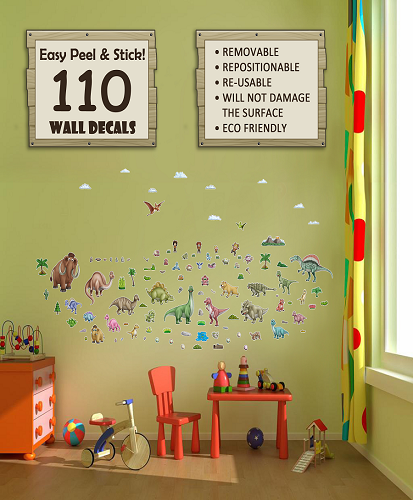 165 reusable, removable and repositionable decals, just peel & stick! 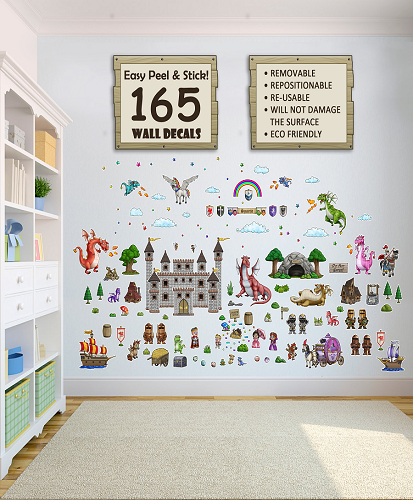 The four sheets (18”x10”) are filled with amazing, beautiful dragons, knights, unicorns, fairies, castles, and other colorful additions, making applying stickers to the walls a fun and an exciting activity. 110 reusable, removable and repositionable decals, just peel & stick! The four sheets (18”x10”) are filled with amazing, beautiful big and small dinosaurs, pre-historic animals, volcanoes, and other colorful additions, making applying stickers to the walls a fun and an exciting activity. 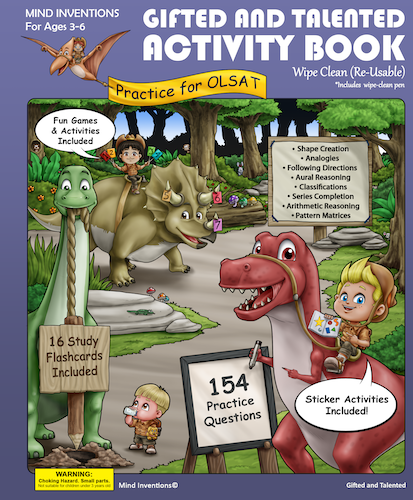 Download our free question package for OLSAT and NNAT2 along with our fun activities. Questions include: Shape Creation, Classifications, Series Completion, Pattern and Puzzle Completion, Analogies, Serial Reasoning, Spatial Visualization, Following Directions and Aural Reasoning, Arithmetic Reasoning and Pattern Matrices. 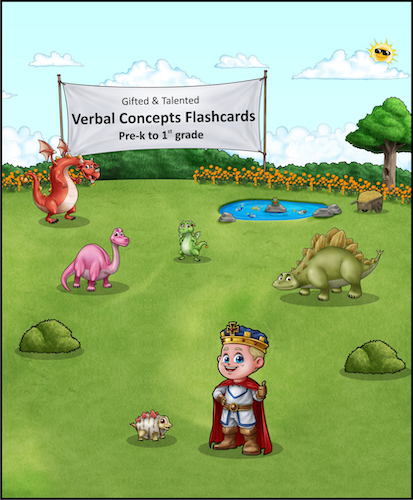 Gifted and Talented WIPE CLEAN (re-usable) Verbal Concepts Flashcard Booklet for children ages 3-6. Learn key vocabulary and concepts for everyday use filled with puzzles and fun activities to make learning fun! 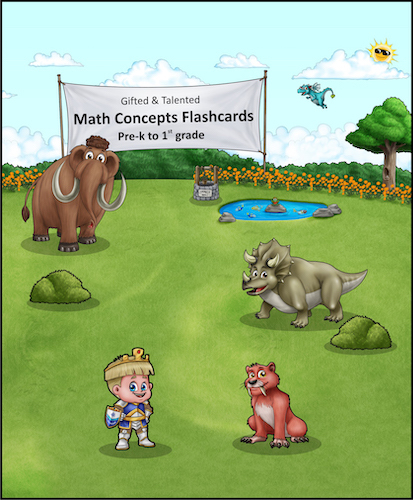 Gifted and Talented WIPE CLEAN (re-usable) Math Concepts Flashcards for children ages 3-6. Learn key math concepts for everyday use filled with puzzles and fun activities to make learning fun! All parents want the best for their children. The idea of Mind Inventions is to help kids learn the thought process in solving problems. We believe exams are not about memorizing questions and answers but more about developing the ability to problem solve and rationalize. Admission exams and gifted assessments are becoming a big part of our lives and can pave the way for our children’s successful future. When preparing our 4 year old son, Henry, for the Gifted & Talented exam, we went through a rigorous search for best possible test questions and tutoring courses. We found that many books ended up being boring and prep courses were extremely expensive and did not achieve the results that we sought. After much research and thought, we designed a focused program that made learning fun. "Got this for my nephew. There are a lot of materials out there for gifted and talented test prep but they do not compare to this book. Very easy to understand and use, fun for the kid and reusable (erasable). This book can also be used as a fun learning book for kids, not necessarily just for test prep." "This guide was not only useful, but simple for a child to understand and digest. The concepts were presented clearly and the re-usable, wipe clean format is particularly helpful for a young child to grasp and reinforce the lessons needed to succeed on test day. Unlike others, this is a study guide that is truly both educational and fun." "In result of this Gifted and Talented Prep book, not only am I closer to my God son (because we spent intimate time together completing this book) but he also scored highly on his test. This Prep book is useful and simple for children, parents (and guardians) to understand and to use. " "I work with kids all the time and I can say this book is one of the best activity books I have seen. The fact that it is wipe clean is a genius idea. Kids write and draw all over and regular books become useless. This books allows kids to redo the problems until they get it right." "My son’s favorite book. It was very fun and entertaining, making the studying more smoothie. My son finished it in two days, and wanting more!!!" "We are prepping for the NYC Gifted and Talented and these books are the BEST of all the books we have purchased. Wish they made different books for all subjects from PK-6! Don’t think twice. Get this book immediately!!!" "Really high quality review book. My almost 4 year old was excited to do this “test”. She’s actually grasping some of the concepts. I love that it’s erasable. It even has stickers for rewards. I can’t recommended it highly enough." "A-M-A-Z-I-N-G! My 3 year old got so excited when opened the book. Exercises are brightly printed, easily wiped out. Fun activities on last page of each section of book."